Billed as a direct sequel to the original Yoshi’s Island and developed by the unproven Arzest, very few carried any faith that Yoshi’s New Island would adequately follow up what I believe to be the single greatest platformer of all time. In the end, they don’t entirely succeed, but the game is far from a colossal failure. Yoshi’s New Island does some things extremely well. As another 2D platformer where Yoshi carries Baby Mario on his back to rescue Baby Luigi, Arzest manages to do Yoshi’s physics great justice. Whether it be the fluttery jumping that takes you a tiny bit higher or the signature egg-throwing that this series is known for, New Island feels like a proper Yoshi’s Island game. And yes, Mario still nostalgically cries like a baby for 10-30 seconds when he gets hit. The 3D visuals, meanwhile, are among the best 3DS has to offer. 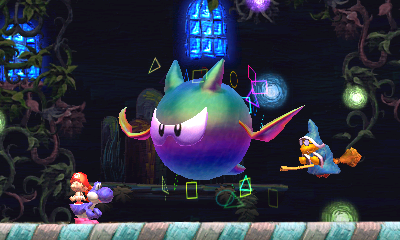 The look has a fluffy pop to it, and at one look at the colored pencil-drawn dynamic backgrounds or the sheen of the returning Blargg enemies, it’s clear that whoever designed the visuals knows how to make those 3DS textures sing. Yoshi’s New Island falls a bit flat elsewhere. Being a Yoshi’s Island game, the levels are long, secret-filled platforming sections with a focus on collecting flowers, red coins, and stars that allow Mario to survive longer when knocked off Yoshi’s back. The levels pull off this style well enough, but they do nothing especially unique or memorable, and too many enemy types are ripped from the original games. It’s nostalgic at first, but a successor can only lean so much on previous works before a game starts to feel a bit like a rehash. Although Yoshi could turn into a helicopter or a submarine in previous games, all vehicle segments in this game are linked to gyro control. For instance, mine cart Yoshi is moved by tilting the 3DS to get through a platforming segment while pressing a face button to jump. The gyro controls work fairly well and the segments are fairly simple, but the gimmick wears thin quickly and the motion control is sometimes finicky. Mega and Metal Eggdozers are the other big new thing, and are gained through eating a giant (or giant metal) Shy Guy or hitting an egg block. Mega Eggdozers are giant eggs thrown to destroy otherwise-permanent things like pipes and certain flooring to clear a path and potentially gain lives. 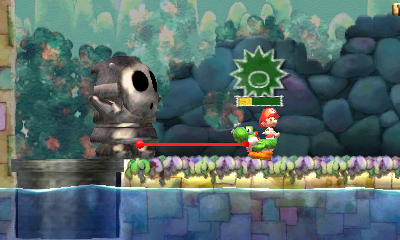 Metal Eggdozers are similar, but they weigh Yoshi down and grant underwater exploration. It’s a shame that they can only be used on specific sections and can’t be taken through the levels, but these sections are among the most memorable. One of the game’s biggest weaknesses is its attempt at boss fights. Yoshi’s New Island reduces nearly all boss altercations into romps where you hit an enemy with an egg at the right time, let it do its attack, and repeat two more times. And instead of having a unique boss fight every four levels like the original, every world has one unique enemy boss at the end and a Kamek fight in-between. So not only is there less diversity compared to previous games, but the fights we do get are extremely bland and extremely easy. This is a criticism I would carry to the main game as well; there’s very little difficulty progression even when getting collectibles, and the difficulty that is there makes New Super Mario Bros. look like Super Meat Boy. I comfortably had 100 lives by the time I beat the game, and that’s a normal playthrough without going overboard in the exploration department. 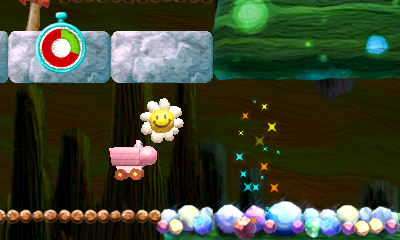 On top of this, the game offers Flutter Wings, an item given to players who lose a few lives in a row that allows them to fly in the air indefinitely. Should you still lose during a level, you will get access to a golden version of these wings, which allows you to fly in the air and take no damage from enemies. The music is equally problematic. Some Mario games take a certain pride in making clever remixes out of the main theme over and over again. Yoshi’s New Island sees this, and uses a rearranged version of its main theme for nearly every single level (which in itself sounds like a heavily rearranged version of the original Flower Garden theme). The difference here is that Yoshi’s New Island doesn’t do a very good job of hiding the fact that these are all pretty much the same song. Some of them, like the jazzy guitar version, sound great. Others, like the kazoo-focused one, are uncomfortably annoying. Regardless, hearing a nearly identical song for every level is just as boring as it sounds. Outside of the main six worlds, the only real additional content consists of two bonus stages per world; one is gained by 100 percenting all eight base levels, and the other is gained by grinding medals from a flower roulette that replaces the post-level mini-games of yesteryear. 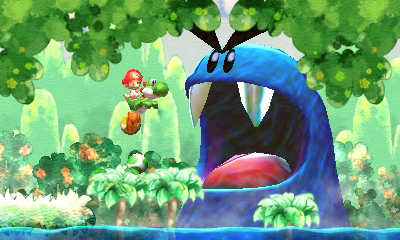 Additionally, the game has six cooperative two-player mini-games involving Yoshi’s platforming skillset. Eggy Pop tasks you to pop as many balloons as possible within the time limit with your eggs, and Flutter Finish challenges you to flutter jump as long as possible. Individual scores are combined, so its exclusively cooperative nature makes the fun of any competition impossible. At least there’s download play. Yoshi’s New Island looks great and plays like a Yoshi’s Island game, but that might not be enough for some people. The levels are bland, the bosses are blander, and the difficulty is too low and too static. It has bursts of creativity and maintains competency, but Yoshi’s Island deserves better than competency. "without going overboard in the exploration department." ?? But that's the whole game. I don't know, this game is clearly getting panned. My only hope is that reviewers aren't playing it to completion. Which in the past, was where the games really shined. Remember that "not going overboard" doesn't mean I played it as a straight platformer. I did a fair amount of exploration -- I just didn't go out of my way to 100% every level. Like many people, this is my third rodeo with Yoshi's Island. I try to play games at their best. Well, I bought it. I liked this 1st level :) I remember wishing I'd let the bad reviews talk me out of Sticker Star. And after that, I did let the bad reviews talk me out of the new Mario and Luigi. But Yoshi's Island is my baby.